Comments: Comments Off on Cleveland sports fans are worse for the loss of Chuck Booms. Cleveland sports fans are worse for the loss of Chuck Booms. NOTE: Today on NNR Samantha Bunten of NBC Sports and I discussed the Wells report, the draft of the AFC North teams and Chuck Booms exit from 92.3 the Fan. Local radio is a tough business. When a station is part of the radio network of a team, the pressure on hosts is even worse. Chuck Booms was a Cleveland sports fan as well as an analyst. The station will likely bring in someone from another market to fill his job. People that have not lived and died with the local teams will not get the respect of the local fans. It takes a lot to be a fan of a city’s teams that have not won a title in over 50 years. Chuck understood that and won the respect of the fans that knew he suffered along with them. I have no idea what caused the issue to remove Chuck but I know that the fan base will be worse off because of it. He brought not only a great knowledge but a wit that Cleveland fans needed to survive the losses that our teams seem to accumulate. While I did not always agree with his analysis, he could always justify his positions. He spoke the truth as he saw it. That is something rather rare on the radio today. He will be missed. NOTE: Friday on NNR Samantha Bunten of NBC Sports and I analyzed the 1st round of the draft. While GM Ray Farmer didn’t quote Blazing Saddles, he expressed the same thing. He seems to feel that everyone expects him to take a wide receiver with every pick. But the Browns don’t need a WR at all. The main reason is that they don’t have a QB that can throw the ball more than 15 yards down field. Josh McCown is old and fragile as candy glass. He had 1 good partial season in Chicago. But he had 2 big fast receivers. He was brought to Tampa by the former Bears coach and named the starter day 1. He rewarded his coach by leading the team to a record of 1-10 and the first pick in the 2015 NFL Draft. For some reason McCown’s 2014 resume was enough to get him hired by the Browns. He has a couple of used WR candidates. With his history that is not a formula for success. Johnny Manziel doesn’t have the physical ability to play in the NFL. But before he even tries to think about that he needs to get his life in order. Anyone that is waiting for him to become a quality NFL starter will be badly disappointed. Connor Shaw has the heart of lion, the head of a coach and the arm of a chicken. In an emergency assignment against the Ravens in game 16 last year he played better than Manziel but does not have an NFL arm. Thad Lewis has more physical skill than any of the other QB candidates on the roster. But he is green as baby peas. He may never develop into a starter but with work can become a decent backup. So without a QB, why would Farmer draft a WR? Clearly he has no intention of taking a WR. But he might want to take a REAL QB. Take a chance on Brett Hundley! He has the arm and mental ability to do the job. In the 4th round he is a STEAL!!! Comments: Comments Off on Maybe the Browns do listen to NNR! Maybe the Browns do listen to NNR! 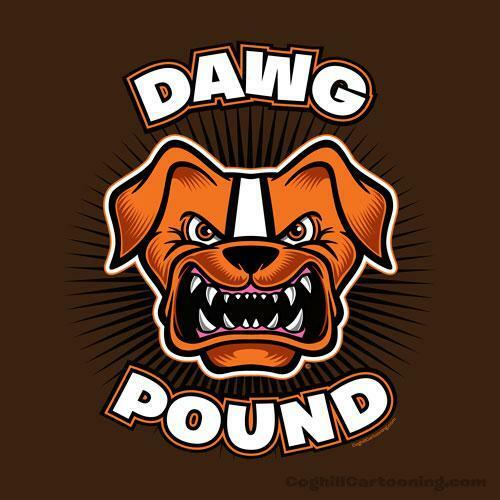 NOTE: Today on NNR Samantha Bunten of NBC Sports and I will disect the Browns first round draft picks. Monday we will do a complete review of the draft. No Johnny Football. No Justin “I don’t want to tackle” Gilbert. The Browns took two solid guys that fill holes on the roster. Teams that are in the playoffs can go “best player available.” But the teams that make the top half of the ranking possible like the Browns need to fill holes with quality guys. The primary need was someone to stop the run. Defensive tackle Danny Shelton was my top run stuffer inside. And trust me nobody at the draft said anything about him wearing a dress! He is a high energy player that leaves everything he has on the field. He splits the double team consistantly and makes tackles for loss. There is some concern about him being on the field in 3rd and long situations. But because the Browns were 32nd at stopping the run, that did not happen often last year. I have no doubt that he will be a very solid pick. The 19th pick in my opinion was brilliant. There were very few OT prospects in this draft. Most of the guys that were listed at T were actually better suited at G. Cam Erving was an exception. He has the feet to play T and the head to call protections at C. Make no mistake, Erving is an insurance policy against Alex Mack opting out of his contract in 2016. Even if Mack stays, Erving can play T, G or C. The Browns can move Mitchell Schwartz inside to G where his lack of quick feet will not be an issue. These two picks were exactly what Samantha and I projected for the Browns. If GM Ray Farmer is listening, I have another suggestion. How about trading a 3rd or 4th pick to the Titans for QB Zach Mettenberger? He has a much better arm than anyone on the roster now and came from a pro style offense at LSU. Of course if the Browns had been listening to NNR before the 2012 draft the QB issue would not be a problem. I was beating the drum for them to select Russell Wilson. He would have solved the QB issue for the Browns for a decade or more. Comments: Comments Off on The NFL gave Columbus Browns and Bengal fans a gift. Comments: Comments Off on Maybe the Browns should listen to the NNR Pod shows. Maybe the Browns should listen to the NNR Pod shows. NOTE: Today on NNR Samantha Bunten of NBC Sports and I projected a complete first round mock draft. It is up on fryingpansports.com/radio-show/. Friday we break down the Browns schedule. In 2011 I recommended the Browns take Colin Kaepernick to solve their QB issue. He was available in the 2nd round. They didn’t listen and Colin took the 49ers to the Super Bowl and 3 NFC championship games. In 2012 I was pounding the desk for the Browns to take Russell Wilson. He was available in the 3rd round. But they didn’t listen and all he did was set the record for the most wins by a rookie QB and win 1 Super Bowl and but for the worst play call in SB history almost win a 2nd straight. In 2014 I was calling for the Browns to take Teddy Bridgewater. He was available at pick 22 but the Browns took Johnny Manziel. While he didn’t take a bad Vikings team to the Super Bowl (no one could have), he had a good season. Even late I recommended they take Zach Mettenberger. He had the best arm in the draft and was available in the 6th round. Again they didn’t listen. It is not like the Browns are waist deep in quality QB candidates. But they don’t listen and probably never will. But I have been studying the draft since 1960. I have seen a lot of QB prospects come and go. This year I would like to see the Browns take either Brett Hundley from UCLA or Bryce Petty from Baylor. Both have better arms than any of the so called QB candidates on the roster now. Hundley threw to receivers running pro route trees (for the most part). Petty has a remarkable easy delivery. However don’t hold your breath. The Browns won’t listen to me or you or anyone for that matter. If they start either Johnny or former TB QB Josh McCown they will be at or close to the 1st overall pick in the 2016 draft. Looks like a plan to “Crash for Cardale” to me. NOTE: News, Notes and Rumors podcast are BACK. Check out our thoughts on Fri days about the games coming up and Monday on the results of the weekend. My co-host is Samantha Bunten of NBC Sports. Podcasts can be heard on https://fryingpansports.com/radio-show/. Thanks for your support.